Tom Harty and Walter Golub walked slowly toward the top of the hill at Woodlawn Cemetery on Vermont 100 just south of Rochester, glancing quickly at a mound covered over with a blue tarp. “That’s three people and a baby,” Harty, a local funeral director said. 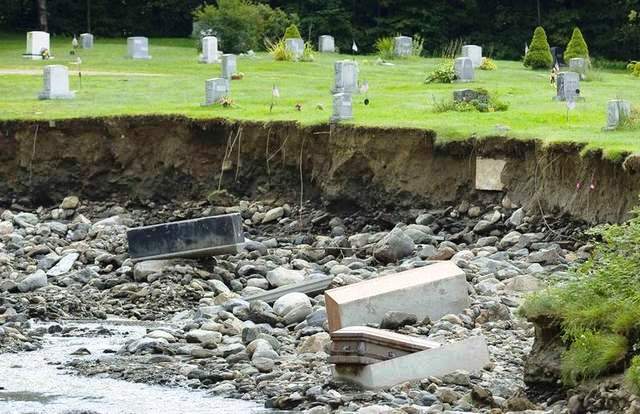 When Sunday’s floodwaters raged through this town, they did not spare the dead buried at Woodlawn Cemetery. On the cemetery’s east side, a dozen coffins lay scattered in haphazard positions alongside a bubbling stream that now runs where an estimated 30 bodies were once buried. Several skeletal remains were found separate from their coffins. Indeed, human bone fragments, sitting in silt with miniature pink flags poked in to the ground next to them, could be seen in the field across Vermont 100 from the cemetery. Harty said Steven Shapiro, the state’s chief medical examiner was en route to Rochester to begin the task of identifying the remains.